Maple Leaf Rag for Piano and Tuba, PDF file. Maple Leaf Rag is a ragtime composed by Scott Joplin in 1899 and along with The Entertainer his most popular. One of his early compositions it became a model for ragtime compositions by subsequent composers. It has been recorded by many well-known artists and featured in among other places in the film The Public Enemy. Sheet Music for Tuba accompanied by Piano arranged by Lars Christian Lundholm. Interested in more amazing sheet music for Piano and Tuba when you are done shopping on this page? Or visit https://www.tradebit.com for more great offers on Piano and Tuba sheet music and backing tracks. All these and Maple Leaf Rag for Piano and Tuba are also available here and at https://www.tradebit.com as eBooks, epub files (perfect for iPads and tablet PC‘s). 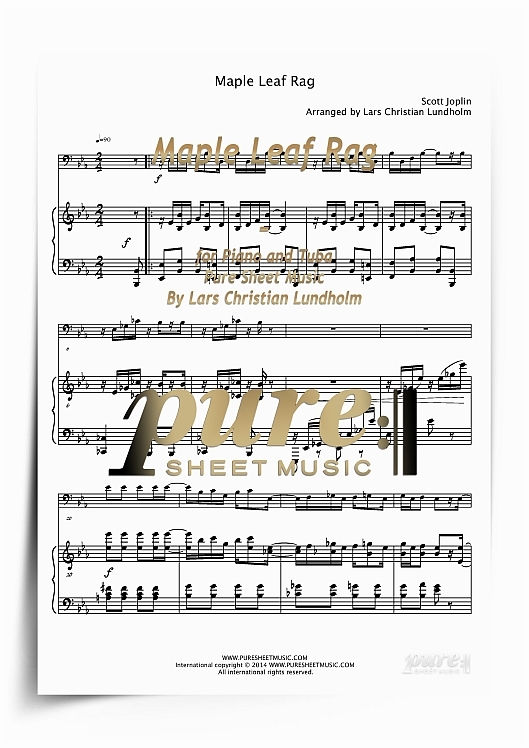 Simply search for "Maple Leaf Rag for Piano and Tuba (EPUB file), Pure Sheet Music as Ebook arranged by Lars Christian Lundholm" if you are looking for the eBook reader/iPad friendly version of this sheet music. Puresheetmusic is the first and leading seller of sheet music as ebooks worldwide including iTunes. We believe in the future and in keeping it pure and we are committed to setting sheet music free and making it apps free and available on all platforms. It is perfect for Print, iPad, eBooks Readers and Table PC‘s.